Deep repair of the hair shaft Mega Conditioner is a deep action ampoule treatment that repairs and hydrates the hair shaft. Its formula with Aloe Vera and keratin guarantee an extreme care of the hair, returning the properties of touch, manageability and combability to dry and mistreated hair. 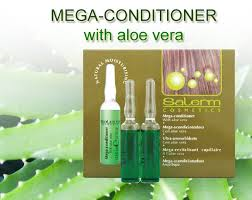 Dissolve the contents of a Mega Conditioner ampoule with 30 ml of water. Blend until you get a cream and apply it to damp hair after washing it with a Salerm Cosmetics shampoo. Leave on for 5 minutes and rinse. Proceed to the hairstyle as usual.